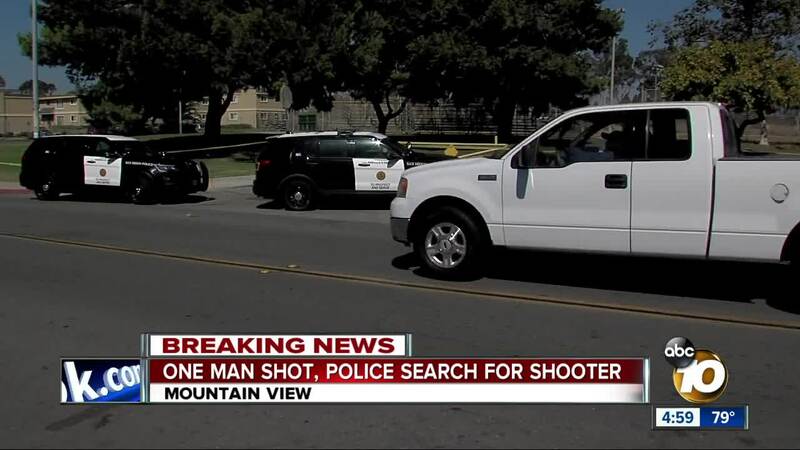 SAN DIEGO (KGTV) - San Diego Police are investigating a possible shooting at a Mountain View sports complex. The shooting was reported about 1 p.m. at the Willie Henderson Sports Complex at S. 45th Street and Logan Avenue, police said. A witness said he saw two men shoot another man in the parking lot, nearest 45th Street. Officers found a trail of blood leading east on S. 45th Street toward Logan Avenue. A woman told 10News a victim had been shot three times in the hand and collapsed in front of her home at West St. and Logan Ave., a block from the sports complex. The witness says he sees children in the park all the time. Lincoln High School, Porter Elementary School, Mt. Erie Christian Academy, and Knox Elementary are all within walking distance of the park. "It’s horrible it’s deplorable it’s on excusable I blame snow any parent that would let a kid knowingly have a fire arm, it's wrong," witness Ernest Jackson said. "There’s no need for that kind of violence, never never never. I mean keep it in your house, if someone breaks into your house or something like that okay but out here," Jackson said shaking his head. If he could say something to the young men who pulled the trigger, it would be, "they're stupid, it's a waste, it's just a waste of energy, time, resources, from the heart. Your family is going to suffer, your friends will suffer, the neighborhood's going to suffer, just because you thought you were cool with a gat." Police said they are still investigating the shooting, anyone with information should call 619-531-2000.